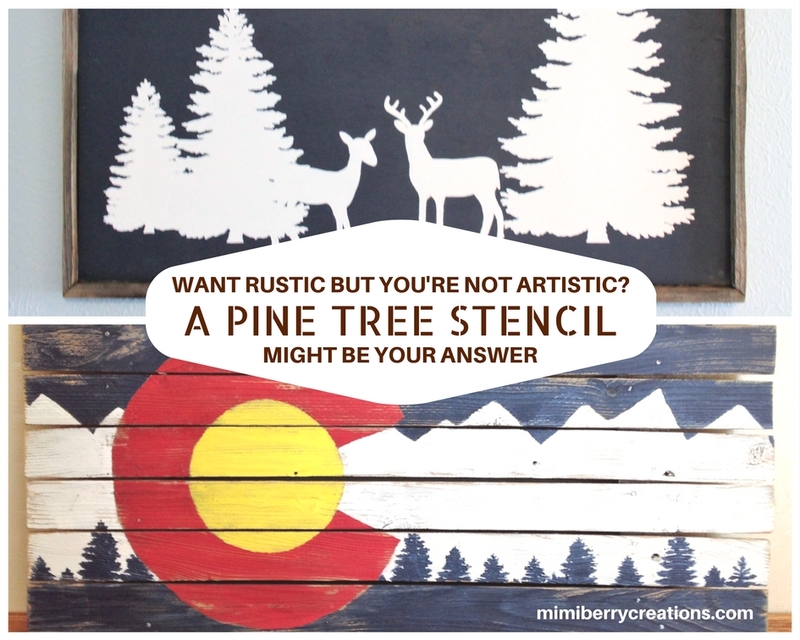 mimiberry creations: Not Artistic but want to make your own Art? Stencils are the Solution! Not Artistic but want to make your own Art? Stencils are the Solution! One of my main purposes of having this website is to help others realize they can make and create things they never thought they could, and have the happiness and fulfillment that comes when they can step back and look at what they were able to do. Because of this goal, most of my DIY tutorials on here do not include anything that requires artistic ability. Drawing has always come naturally to me, so when growing up I remember assuming it did for others too; however I remember in 7th grade in my Speech and Debate class, I taught my class how to draw a simple step by step penguin. My teacher's penguin looked awful, and she was the first to admit it. I then learned that drawing, even when simplified, can still be very difficult. So I don't want any of you to discount yourselves when looking at the wood signs below, because I am here to tell you that YOU can make art that speaks to you for your own home (or to sell), and you don't need to have artistic abilities! Note: Although this is a sponsored post, courtesy of Stencil Revolution, it provides honest feedback on the product, and provides helpful tips and tricks when working with stencils. A month ago I was contacted by the owner of Stencil Revolution to see if I would like to try one of their products and then write about my experience. At the time I didn't have projects on my mind that needed a stencil, but when I went to their website and saw how many detailed stencils they had to choose from, I knew I could come up with a project or two that I could play around with. I have always been partial to trees, (hence my logo and tagline: "Taking a tree's creation & making more creations"), and although I had a lot of stencils I could totally think of uses for, such as the compass, the buck, and the baseball, I decided on the pine trees because they felt so rustic and forest-y, and I am all about that. 2nd: I used my hand sander with 60-100 grit sandpaper and sanded the front, back and sides of the old fences. 3rd: Because the wood was very weathered, I screwed (from behind), the tops and bottom slats to the connecting wood pieces, as well as put in a few nails where the old nails weren't really doing their job anymore. 4th: I used a Home Depot 5 gal bucket and traced the circle that is within the Colorado "C", because it seemed like the right size for the size of my sign (52" x 29"). I then drew a circle a little larger than the circle for the C, and then copied the angles of the C from a picture of a flag. Lastly I drew a random zig-zag line for the mountain tops. 5th: I painted the blue of the sky first, then the yellow circle, the red C, and then the white mountains. I used latex paint from Home Depot that I already had for the blue and white, and for the red and yellow I used indoor/outdoor acrylic paint from Walmart I also had on hand. 6th: Stencil Time When everything was dry, I used my pine tree stencil courtesy of Stencil Revolution. I used the 24"x18" size, which is $29.99, and only used the small and medium sized trees for this sign. I made them slightly overlap each other, and then painted over the base of each tree to the bottom of the sign in blue. Pros: Good durable material so it can be used over and over again, which is great for making signs (or other things) to sell. Super detailed stencil. Easy to clean. Cons: The cutouts are too close to one another. To prevent painting into the neighboring stencil I would suggest putting painters tape over the cutout you don't want to paint. I wanted to cut them and thus separate the three trees, but this is impossible because you would cut into the other stencils. Note: When painting on rough/bumpy wood like this sign, the details of the stencil will get a little lost. When working on a smooth surface you can capture every cutout of the stencil. As much as I loved these two signs and wanted to keep one, Christmas is around the corner and I wanted more spending money for gifts. In about a week's time, each of these signs sold for $100 via a Facebook group page that sells handmade items in my county. For this one I used a piece of 1/4" plywood (dimensions 33"W x 24"H) I had laying around, and two pieces of that fence board that I cut thinner using my table saw. 1st: I used the same Hale Navy paint I had on hand from my Colorado sign for the background, and let dry. 2nd: I used the large tree stencil, and painted that on the right side of the picture. Rather than use a paintbrush like I did for the Colorado sign, I used a small foam roller I had, and found that it was much faster than the brush, and looked better. I then did the same with the medium and small tree cutouts. 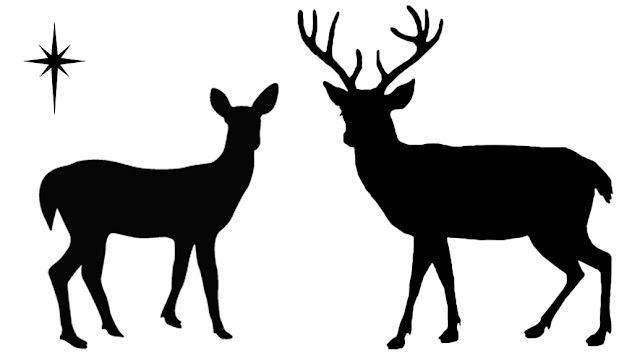 3rd: For the deer and the stars I did freehand their silhouettes in pencil first, but if you need to go the non-artistic route, here is similar clipart you can print out, cut out, and trace (play around with the size you need for your sign before printing). 4th: Once the deer and stars are painted, I took the cut up reclaimed wood and put wood glue on each piece and used my nailer, and nailed them directly into each side of the plywood. Lastly, I added hanging hardware to have the option of hanging it. That's it. Now I have a sign that is great for Christmas AND any day of the year, since deer and pine trees are prevalent in our neighborhood. This is before the stars were added. I couldn't determine what to add to the blank sky, and so I asked my Facebook fans. I got so many great ideas, but one of the most common suggestion was stars. Stencils sure are awesome. I love how easy they are to use and how detailed they are. So that is it! Art is so expensive to buy, why not save yourself a lot of money and create your own. There are so many stencils out there, and so many creative ways to use them. Anyone can be an artist now thanks to stencils.